In conversation Frank Henry spun the pronunciation of “architect” so it landed with a capital A, to reflect a certain mystique and duty attached to the profession. He saw being an Architect as a condition he constantly worked at and aspired to and occasionally (he might be forced to admit) achieved. His renderings are both old-school works of art and technically flawless. He happens to have designed the best single structure in Arizona. There are photos of a young and extremely wiry Frank Henry in the 1950s, smiling, happily established, with a simple square house on the edge of the desert and a good-enough car. Working as an Architect. The building that Frank is most associated with, now and likely for keeps, is the former Valley National Bank branch at 44th Street and Camelback. A visit or re-visit to that amazing, idiosyncratic, deeply original, surreal structure would be one good way to observe Frank’s departure. He won the right to design that branch in an in-house competition while still a young man. It stands as his vision in totality, underwritten by VNB’s Walter Bimson as a gift of good design and open space to the city. Bimson defended it even against the small-minded cost-cutters in his own bank. For your own sake please wander inside and experience it in three dimensions. Photos don’t do. Note of how the windows of that prow frame the view of Camelback. Look at how the daylighting and the dendriform columns work together, and while you’re at it, should you have any experience with or sense of how construction works, try to figure out how the roof stays up. A thing like this can re-awaken your sense of possibility. Frank was also happy and proud of his long association with Taliesin West, where he was evidently well-loved. I regret never taking him up on his offer to show me through the back rooms. Personally. 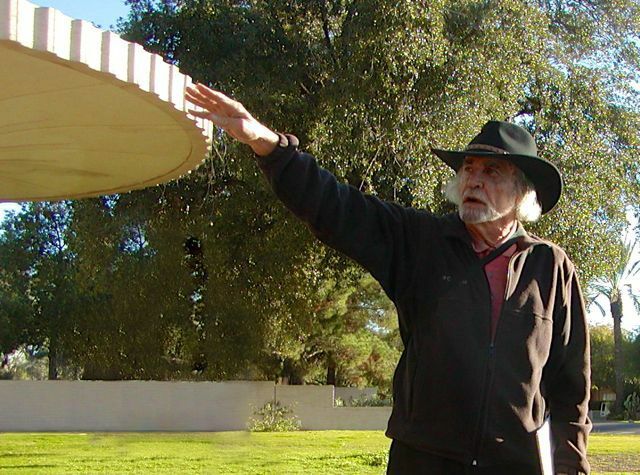 From my first interview, in his Rattenbury-designed home in that Rattenbury-designed subdivision, and in all our discussions through the years, of course Frank talked about his own work. Some. The meanest thing I ever heard him say was about some firm back east somewhere that did design work. Only exterior design work. Facades, in fact. Only facades. Completely divorced from the meaning and structure of the rest of the building if any. Frank’s eyes widened a little with amazed disgust. “Can you believe it?” Most often he was focused on the process and craft of bringing out good design. He consistently pointed out other people’s local work, showing me where to fruitfully dig: Cal Straub, Charles Montooth, Fred Langhorst, Blaine Drake. He had a certain way of saying those names. Those were capital-A guys. He was too.